Last week saw the publication of the results of the Pragmatic Randomised Optimal Platelet and Plasma Ratios (PROPPR) Trial by Holcomb et al. (et al. includes almost all of the big names in massive transfusion in trauma!). It would be remiss of me not to mention the much-cited fact that 40% of traumatic deaths result from massive haemorrhage. The introduction of protocolled and balanced transfusion in major haemorrhage has revolutionised traumatic haemorrhage, however there still remains debate over the most beneficial ratio of blood products. 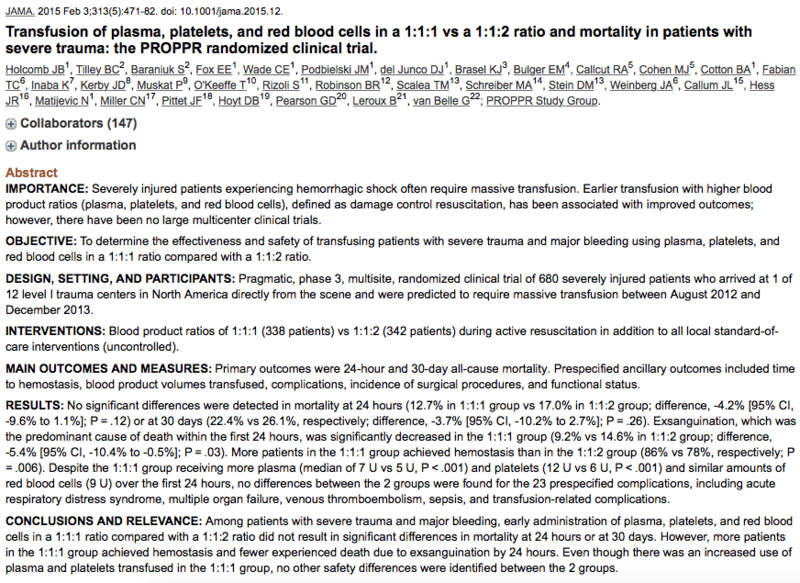 The PROPPR trial is in many ways a follow-on from the Prospective, Observational, Multicentre, Major Trauma Transfusion (PROMMT) study which suggested that a high ratio of plasma and platelets to red blood cells (RBCs) conferred a survival advantage when compared to a lower ratio (1:1 vs 1:2 or lower). The researchers conducted a randomised-controlled Phase III trial; in fact it is the largest RCT to look at transfusion ratios in trauma. Patients enrolled into the trial were either allocated to a ratio of RBC:plasma:platelets of 1:1:1 or 2:1:1. The study used both clinical and laboratory hypotheses; the latter being somewhat academic, and may not be directly relevant to EM, although interesting. The clinical hypotheses were that the 1:1:1 ratio would a) confer a higher 24-hour survival rate and b) confer a higher 30-day survival rate. Resuscitation/haemostasis was considered achieved anatomically by the surgeon and physiologically by the surgeon/anaesthetist. It was at this point that the use of randomised products was discontinued. The inclusion/exclusion criteria are shown below. If the patient satisfied the criteria below and had an ABC score ≥ 2 randomised products were immediately called for from the blood bank. 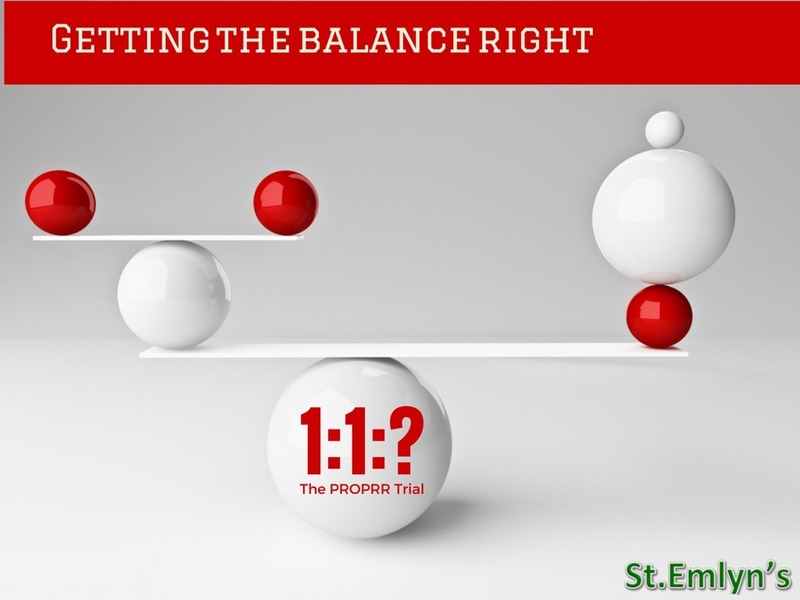 If the score was<2 then the decision was left to the attending physician or surgeon in the ED. The study investigators aimed to enrol 580 patients in total, which they calculated would be sufficiently powered to detect a 10% difference in 24-hour mortality. The study managed to enrol 680 patients, which is fantastic as it allows a meaningful analysis to be made. About 75% of the patients were male and were aged around 30. Around 50% of the patients had suffered blunt injuries and an equal amount penetrating injuries. PROPPR found that there was no difference in mortality at 24-hours or 30-days between the two groups. There was however a significant reduction in the time to haemostasis and death by exsanguination within 24 hours in the 1:1:1 group. There were no significant differences between the groups in terms of additional complications. Arguably the trial was underpowered as many have commented. Major haemorrhage protocols are ubiquitous and largely influenced by the haematologists within individual hospitals. The equivocal results of this study are unlikely to directly affect clinical practice. Given the strain and demands on blood banks (at least that’s the case in the UK), it is perhaps uneconomical to advocate using a 1:1:1 ratio of blood products if it confers no survival advantage. To my knowledge, the activation of major haemorrhage protocols still relies heavily on clinician gestalt (see this paper! ); perhaps the incorporation of scores such as the ABC score will help address this. The debate about using empirical protocols for transfusion in trauma will still rage on. The key to massive transfusion remains speedy identification of appropriate patients, timely delivery of blood products and maintaining a balanced transfusion. Editors note: This blog was drafted on the day of publication but owing to technical issues we were unable to publish until today. Since then a number of other sites have provided in depth analysis of the trial and we strongly recommend you check them out for additional views and comment. Great to see all the #FOAMed goodness being spread around the globe.